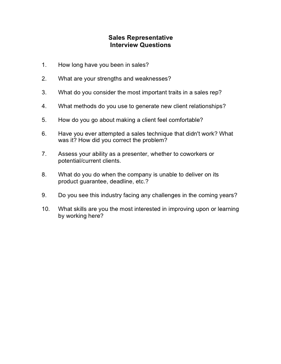 Choose your next Sales Representative with the aid of these helpful interview questions. 1. How long have you been in sales? 3. What do you consider the most important traits in a sales rep? 4. What methods do you use to generate new client relationships? 5. How do you go about making a client feel comfortable? 6. Have you ever attempted a sales technique that didn't work? What was it? How did you correct the problem? 7. Assess your ability as a presenter, whether to coworkers or potential/current clients. 8. What do you do when the company is unable to deliver on its product guarantee, deadline, etc.? 9. Do you see this industry facing any challenges in the coming years? 10. What skills are you the most interested in improving upon or learning by working here?